The Great British Barber Bash’s second live London show took place in the super cool Oval Space in Bethnal Green. With over 400 barbers in attendance from across the globe, the event was another successful sell-out for the GBBB team. 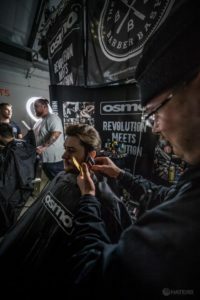 As main sponsor, the OSMO stand was in prime position in the centre of the room and featured the Grooming and Styling ranges on offer along with a live demonstration area. 4 large OSMO banners were also hung around the room giving strong brand presence throughout the show. Live demonstrations took place on the OSMO stand throughout the day with 2 barbers cutting at any one time. The barbers included brand ambassadors Justin Carr and Myles Lewis amongst others. Justin’s celebrity Instagram status drew a large crowd to the OSMO stand with attendees eager for a selfie with the barber as much as to watch him cut. 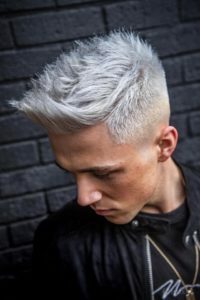 Both Justin and Myles also took to the main stage at different times throughout the day – Myles to both compere and cut and Justin in prime slot along with Slider Cuts. The GBBB appeal from a global perspective only seems to be growing. Barbers from Russia, Canada, Switzerland, Italy, Spain, Portugal, Prague and Holland all made the journey to attend the show and to network with fellow industry professionals. OSMO’s extensive product ranges proved as popular as ever with great feedback received from both new and existing customers. OSMO goody bags were distributed to everyone that attended.